31Mar -3 April 1989. Grand Canyon, Arizona. I'm on the last leg of my Tonto Trail Hikes. This section between South Bass and Boucher canyons will complete my traverse of the route from the Little Colorado River to Elves Chasm, about 95 river miles. Tonight I am at Serpentine Canyon, about 4 miles upriver from South. Bass. I came in about 10 miles today, most of which wasn't too bad. The last four miles were in the very hot afternoon sun (can it really be this hot this early?). Fortunately, this spot is cool in the evening and has trickling water so I am very comfortable. Hiking down South Bass seemed fairly easy. This was my third time down that trail so maybe I'm getting used to it. I especially enjoyed crossing the Esplanade with its dwarf evergreen vegetation and long views. Bass Canyon was brushy but the trail was easy to follow. The Tonto Plateau is nice with some good views of the river. But it's hot in the afternoon sun. Day two rolls by in a blur of effort. Crossing the Tonto in the heat takes its toll. There is little shade and the trail wanders in and out of many side canyons which make for a long day. Fortunately, we had cloud cover for much of the the day and found a little shade under ledges in a few places. Ruby Canyon was the nicest spot. We arrived around 10:00 and found nice shade, cool rocks and a few pools of water. Turquoise Canyon was a bit of a disappointment: no shade and only the barest trickle of water. We waited out a thunderstorm--it was mainly on the North Rim but we got a few drops of rain before rolling out at 4:30. We made a late camp in Sapphire Canyon which had a good water flow. We were all tired. I barely finished eating before dropping off to sleep. Day three is much nicer. We start early and are in by 1:30. Walking was good all day although it got warm during the last couple hours. Slate Creek was the major drainage crossing--probably goes back a couple miles or so. Morning views were wonderful--soft light filtering through the buttes and canyons. The whole day was one of changing light from morning subtlety to the high sun of mid afternoon. Now we are resting at Boucher Creek in what little shade we can find, waiting for the sun to drop behind the canyon wall. We all lounged in the creek to wash off trail dirt and feel pretty good despite the heat. Now the hike is over and I can say I've covered the entire Tonto Trail and then some. We came out in about six and a half hours of steady climbing--9 miles and 4400 feet. I was out of camp by 6:00 so I got to see the sunrise and the soft morning light and beat the heat (for a while). Boucher Trail is tough either way. I still remember how hard it was coming down in 85. Climbing is marginally easier but no less work. The trail is easy to follow but hard to walk: lots of loose rock and heavy brush. Have to step carefully as the trail skirts the top of some sheer walls. I climb in segments: 2600 feet and 2 miles to White's Butte, then straight up the back of Travertine Canyon for about 1500 feet, an easy traverse from Yuma Point to Dripping Springs being careful as it skirts the top of a sheer wall and cuts across small drainages. I'm high enough now to see Hermit Rapids. Dripping Springs to the top is the hardest. I'm tired and the day is now very warm. There's no shade, the light reflects harshly from the bright Coconino sandstone, burning into my eyes. I step slowly and deliberately. My stomach is queasy so I don't feel like eating--a bad mistake since I need all the energy I can muster. finally, the trailhead on the rim! I drop my pack and fall on to it. Just shovel me into the car and take me home. In all, this was a great hike. Not only did I achieve a personal milestone but I had the chance to share the Canyon environment with a good group of friends . We travelled well, each at his or her own pace but never far apart. We encountered and dealt with problems along the way: my lost water bottle, Colleen's feet, Rick's stove, Randy's chair and Bill's anything(?). We were mutually supportive, especially in pumping water. We covered some difficult ground but we also came to know and feel the Canyon; its shapes and textures, its stillness, exuberance and challenge. My favorite camp was Sapphire Canyon. When we reached that spot at the end of the second day we were not only assured of completing the trip in time but also had water to clean up and slake our thirst. We contoured through 12 side canyons--three were immense, sheer walled drainages cutting well back to the rim for miles. Walking into these large side canyons I could see the ledge I was walking on meeting the drainage one or two miles back. Not obvious was how much farther back the side canyons are carved. Crossing so many side canyons was tedious and tiring, especially in the unusual heat of early April. They were obstacles in the way of some very important goals: rest and relaxation. Sapphire Canyon was a favorite also because of the late afternoon walk in from Turquoise Canyon. Wonderful, late afternoon shadows and colors played across the Tonto Plateau and the rocks towering above it. The heat was dissipating. Sapphire was deep in shadow as the last light made it almost glow. Russia, 1931. An Albanian Jew, Razeer Shtube, a barber fleeing fascist persecution in his homeland seeks refuge in the “workers’ paradise” under construction in the Soviet Union. He not only finds refuge but a wife, newly widowed after the death of her abusive husband. Unlike the deceased husband, Razeer is kind but in Stalin’s Russia he is also always wary. His skill as a barber draws the attention of his stepson, Dimitri, a KGB officer, who recommends him as a replacement for Josef Stalin's recently dismissed barber. Razeer recognizes the risk—the closer to power, the greater the danger—but takes the job and his chances. Stalin’s Barber vividly and chillingly re-creates Russia during the unfolding years of Stalin’s dictatorship where people live double lives, their private thoughts at odds with the public persona required to avoid the scrutiny of an all-encompassing ideology and all-too-ruthless state. Paul Levitt vividly recreates Russia in the 1930’s. Razeer and his family live in the Kremlin and move among the new Soviet elite. Then the purges begin. They witness the purges as neighbors disappear. They experience exile, hardship and, for some, survival. The story is chilling one but Levitt also demonstrates how human beings manage the hand they are dealt. Razeer, Anna, her children and Yelana, their adopted daughter, retain their humanity even as events become foreboding, more dire and outright dangerous. Stalin’s Barber is a tale of difficult lives and times, well told and a fascinating read for students of Russian History. 20-22 March 1981. Mt. Rogers, Virginia Gray drizzly day as we head out from Blacksburg. Expecting snow, wondering what the road to trail head will be like. Can we even make it? Run into snow driving up mountain but road is passable. Heavy snow at Elk Gap as we start out. Walk up old road instead of AT. Woods are blinding white. Find shelter and, to our surprise, other people. Set up tent behind shelter. Warm and toasty inside. Snow ends during night. Next day is bright and sunny. Meet other campers who are part of the Hike A Nation cross country hike. Amazing to think that these people have been on trail for almost a year. Load up one pack for day hike to Mt Rogers summit. Walking in winter wonderland. Open bald knobs offer good, snowy views. Summit is heavily wooded. Except for sign, I could not tell I was on summit. Return trip finds most of the snow gone from the balds. 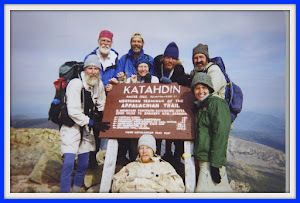 Meet more Hike A Nation travelers. Still chilly. Hike out next day is easy. This time on AT. 2013 has introduced me to the writer, Ben Fountain. A review of Billy Lynn's Long Halftime Walk, Fountain's novel about the Iraq War first drew my attention. I'm a sucker for war fiction which to my way of thinking is about the only way a writer can convey war's genuine absurdity and the many ways individual find a way to survive that absurd but deadly experience. The story, about an infantry squad whose heroism under fire is captured video and vaults them into a two-week celebrity US tour to rebuild flagging support for a war has worn out its welcome, is a clever indirect look at war and the society that sends its soldiers to war. Fountain's narrator, Billy Lynn, is 19 from small-town Texas. He understands his job but little about the world. For Billy, the two week tour is almost as harrowing as the war itself. At least in combat, Billy knows the score, knows how to act. Mixing with celebrities and a fawning public that knows the mantra "Support the Troops" far more than it knows what it is supporting them to do, is more challenging and leaves him uncertain about what seemed so certain under fire. Billy's gradual awaking is set among the glitz and pageantry of Thanksgiving Day football. The backstory is slowly revealed as the day progresses and Billy's fellow soldiers, now known popularly as "the Bravos" find their way through all of the hype. Fountain makes it all sound real, each Bravo is a fully developed individual with his own take on the war. They are young grunts, acting as young soldiers do, looking for the party, looking for the escape from the reality that always awaits them. Along the way they provide a mirror that shows America still unwilling to recognize that reality. That deeper truth is what makes the story real to me. Fountain's soldiers are blasphemous, their world laced with black humor. The Bravos worldview is the eternal worldview of the infantry soldier; their inevitable fate frees them of the lies that the living build to protect themselves from the truth. For the infantry soldier, life is short and cheap. The infantry soldier can live with that. Fountain tells the story well, with lively characters. So well that I immediately found a copy of his short story collection, Brief Encounters with Che Guevara. The format and settings are different but here too Fountain demonstrates his ability to get beyond fact and objective reality to examine human thought and behavior. None of the characters in these stories are in control, not John Blair, the ornithologist held captive by rebel guerrillas; not Jill, the aid worker in Sierra Leone; not the Haitian fishermen who find the drugs left on the shore. None are in charge but most figure something out. They manage. All of the stories are compelling and eminently believable.